If you're one of the millions of Facebook users that are addicted to FarmVille, you will know how tedious and time consuming it is to maintain a farm. You have to get up at all hours of the night, make sure you have five minutes available at work to harvest strawberries or run home because one of your fields isn't going to be plowed,... With FarmVille Tools these problems will be over. 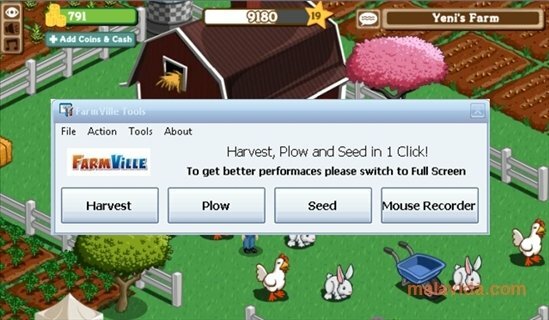 This software application works in the most simple way, it only has four options, as soon as you open it will tell you that the farm zoom has to be adjusted, and after that, each of the programs buttons will activate an action: harvest, plow, or even to save the movements and clicks of the mouse to carry out other actions that aren't so usual. Thanks to FarmVille Tools, keeping your farm in perfect order and earning money will not be at all complicated. The crops will be harvested automatically when you choose, the plants will grow on their own and the fields will always be in perfect conditions. What else could you ask for? So now you know, if you are hooked onto "Facebook Farm", this software will come in very hand and will help you to have an incredible farm in no time at all. The trial version can be used for a limited amount of time.